Proper oral care begins with a clean mouth. That’s why the staff here at Springfield Smiles is very meticulous in ensuring that your teeth are as clean as possible. We remove the plaque and tartar buildup from your teeth, floss them, and polish each tooth. Plus we are committed to making each patient as comfortable as possible. We take extra time with children and walk them through each and every step to help ensure they are as relaxed as possible. When is it appropriate to bring in your child for an exam and cleaning? The ADA recommends regular dental check-ups, including a visit to the dentist within six months of the eruption of the first tooth, and no later than the child’s first birthday. Dr. Victor endorses this policy, and as the child grow, he encourages you to bring your child with you to your exams in order for them to get used to the Dentist’s office. Dr. Victor offers free exams for children under 5, or until a treatment need is identified, whichever is sooner. At Springfield Smiles, we are happy to start cleanings for your child as soon as you and your child are comfortable to do so. Periodontal treatment methods depend upon the type and severity of the disease. If the disease is caught in the early Gingivitis stage, and no damage has been done, a good professional cleaning and improved daily oral hygiene can typically resolve the issue. However, in more advanced stages, such as Mild Periodontitis and Advanced Periodontitis, a special cleaning called scaling and root planning is required in order to debride the diseased tissue. When the plaque and tartar build up goes beyond 3mm (1/8 inch) of the exposed crown of the tooth, it is necessary to perform a deeper cleaning of the root surface. Scaling and root planing allow us to clean this buildup away from the root surface and reduce the bacterial load in the gingival sulcus (the space between the tooth and the gum tissue). Once cleaned, the body has a chance to heal, and ideally reduce the depth of the gingival sulcus. Scaling and root planning is sometimes referred to as “periodontal” or “deep cleaning” and may take more than one visit. During scaling and root planning, a local anesthetic may be given to reduce any discomfort. Dr. Victor’s team will use special instruments called scalers and an ultrasonic cleaner to carefully remove plaque and tartar from the periodontal pockets. The tooth’s root surfaces are then smoothed or “planed”. Sometimes, special medications may be used in order to help resolve the infection. At the next visit, Dr. Victor will evaluate the periodontal response to the treatments. Ideally, the disease progression will have stopped, and pocket depths reduced back to healthy, maintainable levels. 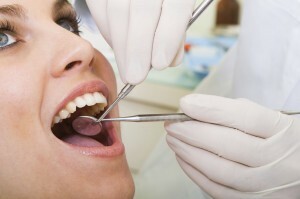 If this is the case, it will be important to continue good daily oral hygiene and regular professional cleanings. However, in some cases the disease progression will be far enough along that the periodontal pockets remain deep and do not heal completely after scaling and root planing. In these instances, additional procedures such as periodontal surgery may be needed to reduce the pocket depth and make the teeth easier to keep clean. Surgery allows access to areas that are otherwise inaccessible for the removal of tartar and plaque. It may also include modification of the diseased tissue or bone grafts in order to reshape or rebuild bone structure destroyed by periodontal disease. In advanced cases like these, Dr. Victor refers his patients to specially trained and board certified Periodontists in order to ensure the best treatment is provided. For more information, visit our educational page on periodontal disease.